Former Army Chief V K Singh is BJP Candidate from Ghaziabad. 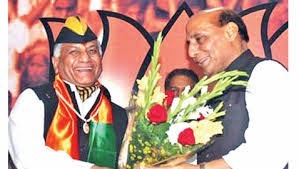 Bharatiya Janata Party (BJP) on Tuesday named former Army Chief V K Singh as its Lok Sabha candidate from Ghaziabad, a seat represented by party chief Rajnath Singh earlier. The party made a formal announcement in this regard and came out with a list carrying Singh's name along with that of Shibun Lyngdoh who has been fielded from Shillong Lok Sabha constituency. Singh replaces Rajnath Singh, who has since moved to Lucknow constituency, and will face Congress' actor-turned-politician Raj Bhabbar and AAP's Shazia Ilmi. However, a number of BJP workers from Ghaziabad came out to protest against his candidature outside the party headquarters even before his name was made official. Party general secretary Ananth Kumar said the BJP chief approved the recommendations of Meghalaya and Uttar Pradesh state election committees on the candidates declared on Tuesday.